The Hericium. There are four or five kinds in North America, but it doesn't matter which one for the purposes of eating - all four are safe and good to eat. It looks like a white grouping of icicles. I have read they taste like crab meat, I don't know, I've never had crab, but I can tell you that a good fresh one cooked properly is very good. Again, the first time you eat any new food, especially mushrooms, only eat a little to be sure you are not allergic to it. How to grow Hericium mushrooms here (Google search) and here (Bing search). The rules for picking are: Harvest only when very white in color. As they get older, the color changes to a tan or yellowish hue of white. When immature, they can be a pinkish hue. Carefully look for bugs hiding in them. When cooking, fry in oil with onion and/or garlic until a light golden brown appears in thinner areas or on the tips of each "icicle". One thing to be aware of; they absorb water like a sponge, so if you do rinse it, place the slices on dry paper towel or a clean tea towel and press with another on top to soak out the water. It will just cook better. Below, I've listed the ones I know of. The most common one I know of in kits is the first one listed, the Lion's Mane. 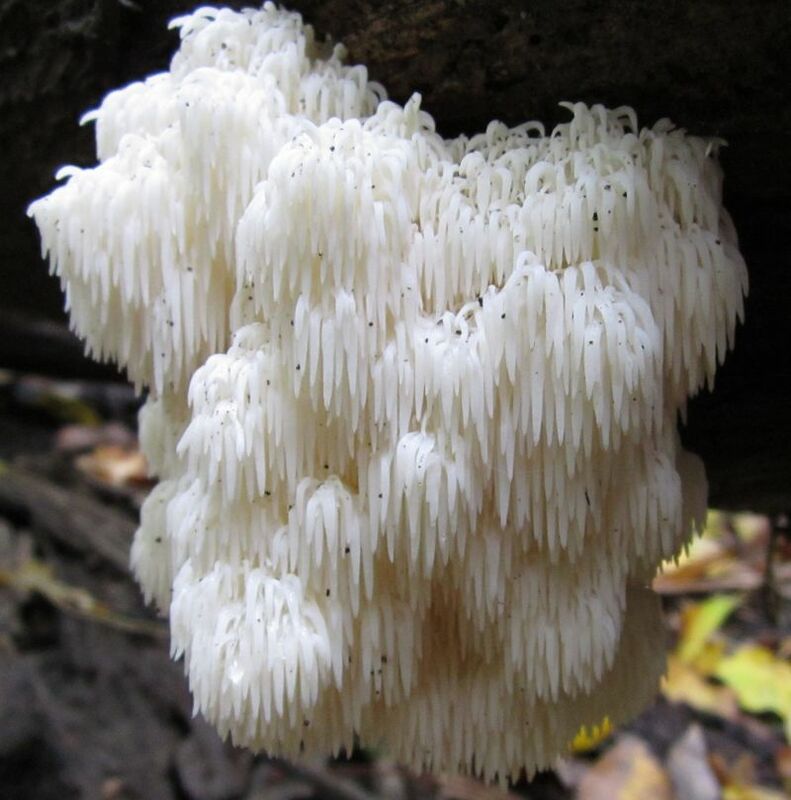 Lion's Mane Mushroom (Hericium erinaceus). Other names for it are: Old Man's Beard, Bearded Tooth Mushroom, Hedgehog Mushroom, Satyr's Beard, Bearded Hedgehog Mushroom, Pom Pom mushroom, or Bearded Tooth Fungus. Pictures on the web here (Google images) and here (Bing images). Bear's Head (Hericium abietis). Known also as the Western Coral Hedgehog. Some sources say it is a Western North American species only, some say it is all across North America. Pictures on the web here (Google images) and here (Bing images). Comb Hericium (Hericium ramosum). This one is more spread out in a branching growth habit. Pictures on the web here (Google images) and here (Bing images). 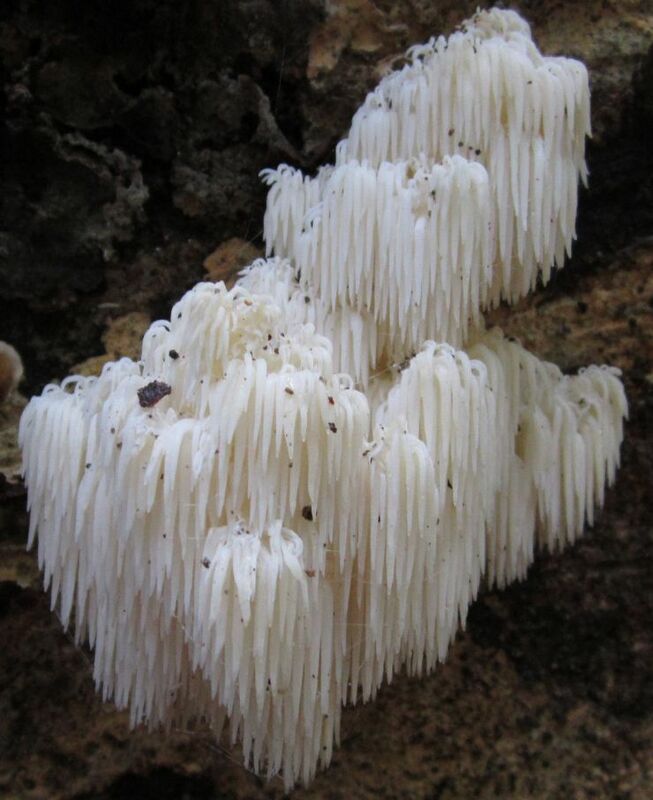 Hericium americanum. Pictures on the web here (Google images) and here (Bing images). 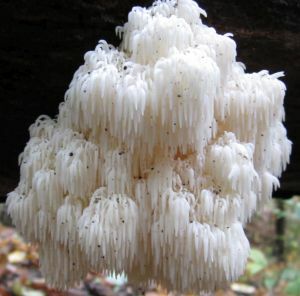 Hericium coralloides. Pictures on the web here (Google images) and here (Bing images). Habitat: On living or dead wood. I don't often see it on living wood, most often coming off the sides or ends of fallen tree trunks. Notes: This is a category busting mushroom, so the above ways of describing most mushrooms do not apply very well. As long as you realize it is a single lump to a branched network of icicle like downward facing teeth and white on living or dead wood you will be able to know one when you see it. This Hericium was found growing from a sugar maple log in a woods in mid October after a spell of cool weather and rain. I can't think of anything else that looks like a Hericium. Make sure it is very white in color - as it gets older it takes on a yellowish, or tan color. On eat the very white ones. This Hericium was growing from a sugar maple stump in mid October after cool weather and rain. The bits of dark spots you see on it are just leaf and bark litter that will wash off.